6.1M/20 foot Overall height Pivoting based mast for ease of windsock servicing , including Stainless steel swivel head and arm in polished metal finish with stainless steel sealed bearing races. Mast and base sections in hot dip galvanised finish for Marine or corrosive atmosphere applications . 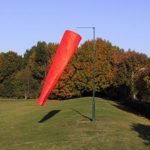 Suitable for flying windsocks up to and including International Airport size (4.27M/ 14 foot).